Why Should You Buy a Motorcycle Windshield? Decreasing wind blast reduces riding fatigue. It's that simple. Whether it's a long Sunday cruise or a week-long tour, staying alert and well conditioned in the saddle greatly helps in getting you to your destination in one piece. In inclement weather, a windshield offers increased comfort and protection from the elements. You don't ride in the rain hoping to get wetter, or ride in cold weather hoping to get frostbite. 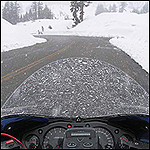 You use a windshield to manage riding in weather that keeps other riders indoors. It keeps your teeth clean, too! There are lots of things you can add to your bike to increase your riding enjoyment or to improve your bike's versatility or performance. 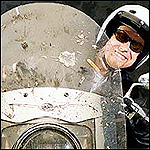 A windshield is a low-cost investment that pays big dividends, as it will certainly improve your riding experience. Even a high-end windshield system, like our quick release SwitchBlade® windshields, is a small investment compared to suspension upgrades, exhaust systems or engine performance work. In fact, windshields are affordable enough that you could buy two different sizes or styles to increase the day-to-day potential of your motorcycle. Most motorcycle modifications tend to be fairly difficult to undo or else downright irreversible. When you have a quick release windshield, you have a modification that's easy to change. 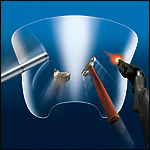 Our SwitchBlade windshields can be removed, changed, or reinstalled in less than 5 seconds. Our wide range of QuickSet™ windshields can be removed in under 15 seconds. Even our "permanent" windshields, like our Heavy Duty™ line, can be removed with simple tools in about 15 minutes. Feel like riding without a shield on hot summer days? No problem! Need a bigger windshield for those cold and rainy days? Still no problem! The versatility of National Cycle's windshields gives you the best of both worlds. What Are the Benefits of Riding With a Windshield? Windshields can help combat fatigue, back pain, and arm strain by removing the wind blast to your face and chest. Less air pushing against your body results in a more comfortable and enjoyable ride. Our unique line of patented VStream® windscreens are specially designed and engineered to divert turbulent wind out and away from you and your passenger. Less turbulence equals more comfort and more miles. If you're planning more than just a few hours in the saddle, a windshield will pay dividends at the end of the day. It's no surprise that a windshield that diverts dry, hot turbulent air will also divert wet, cold turbulent air. Rain or shine, a windshield makes weather a secondary consideration when hitting the road on two wheels. This is particularly important when you're 500 miles – or more – from home, and you don't have the time, money or the luxury of spending a rainy day in a dry, warm motel room. Comfort and enjoyment always come first. Staying warm and dry extends your riding time and lets you cover more miles safely. 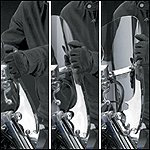 Add a set of National Cycle Chrome Lowers and Hand Deflectors for even more weather protection! National Cycle windshields and fairings are designed to provide wind protection and increased riding comfort, but not protection in the event of a collision with another vehicle, an animal, or any other object. Just the same, it gives us great pleasure when we get letters from riders attesting to the strength of our windshields upon impact with birds, ball peen hammers, and even deer! We don't recommend that you have a friend toss a hammer at you while riding to prove a point. But if something unfriendly comes your way on the road and you don't have a strong windshield, you'll really wish you had one. What Do You Need to Look For in a Windshield? What are the benefits of hardcoated polycarbonate? Outstanding impact strength! Nothing else comes close to matching the impact strength of polycarbonate, making it the ideal material for motorcycle windscreens. It is 10X stronger than High Impact Acrylic and 20X more impact resistant than acrylic plastic (Lucite®). Real world testimonials, like the one from a customer who met a ball peen hammer at 75MPH, attest to the outstanding impact strength of polycarbonate. 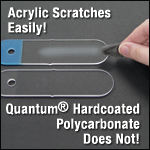 National Cycle's exclusive Quantum® hardcoating is the new benchmark in scratch resistance! It's 30X more scratch resistant than typical acrylic windshields! Think of it as 30X more miles per windshield and you'll understand why it's a valuable feature. Quantum even has 10X better scratch resistance than the FMR hardcoating used by most OEM manufacturers and aftermarket windshield companies! That's the kind of performance, strength and durability riders need from a motorcycle windshield! 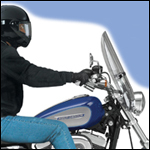 National Cycle windshields and windscreens use thick, quality polycarbonate that is dimensionally thermoformed and not simply rolled into a curve. The deeper, full-bodied design provides better airflow and protection for the rider and the passenger, and greater stability in crosswinds. It's another example of National Cycle's no-compromise approach when it comes to quality. All edges are routed to a smooth, clean radius. Drill holes are computer controlled on state-of-the-art equipment for guaranteed fit. 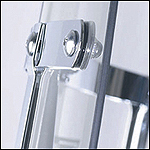 All hardware is quality chromed steel and stainless steel, and has more strength than needed – not less. National Cycle Mount Kits are model-specific, and not "universal" fitments. Each kit is designed to fit a unique bike to ensure perfect fit and optimum clearances. 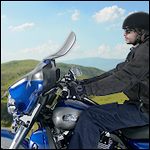 National Cycle's many patented and unique features – SwitchBlade® Quick Release Mounts, VStream® aeroacoustics, QuickSet™ hardware, Key-Lock security, Quantum® hardcoating – mean you are getting the most advanced windshield possible from the world's leader in windshield technology. 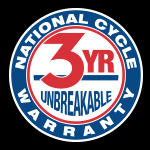 All National Cycle polycarbonate windshields and windscreens are covered by our unprecedented 3-Year Warranty against breakage. 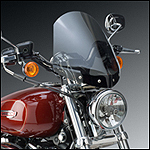 National Cycle windshields are designed to provide many years of superior performance. We are so confident in the strength and durability of our hardcoated polycarbonate windshields that we will replace them if they break for any reason (other than intentional abuse or chemical damage) for a period of three years from the date of purchase. No one else backs up their windshields like National Cycle! Click PRODUCT CATALOG in the Main Menu to explore our range of windshields.